Trees are often topped to reduce height or shape, leaving branch stubs and little or no foliage. Trees can be, and are, often damaged by this inferior workmanship. This damage, unfortunately, lasts for the lifetime of the tree. Tree topping should never be a part of your arboricultural program. 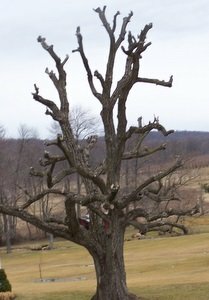 Proper crown reduction pruning safely reduces a tree’s size and redirect its growth. What happens when trees are topped? Trees maintain a delicate crown-to-root ratio. Topping removes the crown, upsetting this ratio and limiting the tree’s ability to sustain its own roots. This makes them more susceptible to insects and disease, and particularly decay. Limbs weakened by decay cannot handle the weight of rapid re-growth. In a few years, if the tree survives, it may become a bigger safety hazard than it was prior to topping. “Lion’s-tailing” is another practice that severely damages trees. In this case the inner foliage, branches, and limbs of a tree are stripped bare. The lion-tailed tree has the unnatural form of a giant umbrella, with the remaining foliage limited to the ends of the branches! The limbs left on the tree are long and bare except for a characteristic “tuft” of foliage at the end, giving the appearance of a lion’s tail. Lion’s-tailing should never be confused with proper thinning, which is the selective removal of branches to decrease weight and wind resistance. Tree topping and/or Lions-tailing should never be a part of your arboricultural program. By topping a tree you are inflicting irreparable damage to your tree. There are numerous ways by which the canopy of the tree can be reduced or thinned without topping. Call us – we’ll explain.